The Wits women’s basketball second team (L2) remains at the bottom of the league even after winning 50-33 against the Soweto Raptors on Thursday, April 12, at Wits University. The Raptors started the game strong in defence but struggled to turn their strength into goals in the first quarter. 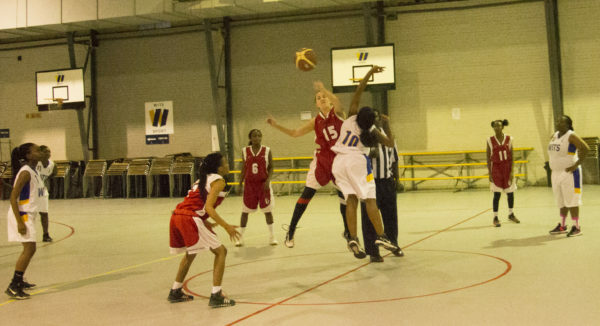 Wits L2 had a slow start but their strong formation resulted in them leading the first quarter. The second quarter saw a decline in the defence of the Raptors as the Wits L2 increased their pace and strengthened their formation. Their strength resulted in them leading the second quarter. The defence, form and conversion of offence into goals by Wits continued throughout the game. The defence of the Raptors remained strong but the dominant strategy of the Wits L2 made it difficult for them to convert their opportunities into goals. Umpire of the game, Mpho Makhubela, told Wits Vuvuzela that the game was a one-sided match. “They [Raptors] tried to come back but it was too late. The age gap between students and high scholars has an impact on the performance of the teams,” he said. The Raptors persevered through the game as the Young Bucks dominated the three quarters of the game. The Wits L2’s next game is against the University of Johannesburg first division on Saturday, April 14 at 10:00 at Wits. Wits Vuvuzela, Wits beats UJ in men’s St John’s Basketball tournament, March 6, 2018.